This section will be useful to help you assess student work for global competence. You will find a checklist under Teaching for Global Competence, which may be useful when creating a global activity in your school. When using the Global Education Checklist it will help with understanding the level of global competency in your classroom and community by using a checklist. Read below to find out more, and click on each one to download a copy. 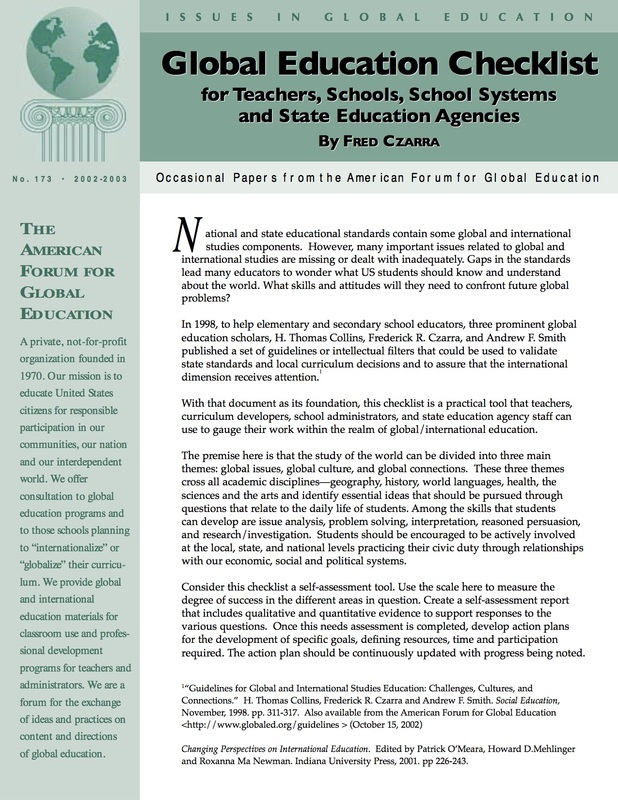 "Global Education Checklist for Teachers, Schools, School Systems and State Education Agencies," by Fred Czarra. The document is a foundation and checklist of practical tool that teachers, curriculum developers, school administrators, and state education agency staff can use to gauge their global/international work. Mr. Fed Czarra states the study of the world can be divided into three main themes: global issues, global culture, and global connections. These three themes cross all academic disciplines—geography, history, world languages, health, the sciences and the arts and identify essential ideas that should be pursued through questions that relate to the daily life of students. I found this resource very useful when trying to decide where I was with global education in my classroom and where I would go with it. I found pages 5 and 6 very useful - Questions about Schools for Principals,Teachers and Community Leaders. Here is an excellent document that will help you check students for global competence in your classroom during a lesson or project. Art, Language Arts, Mathematics, Science, Social Studies and World Languages are all discussed in a matrix form, additionally the four global competencies Investigate the World, Recognize Perspectives, Communicate Ideas and Take Action are explained, too. 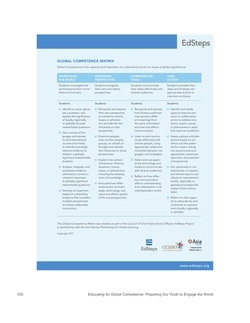 From EdSteps: Global Competence is the capacity and disposition to understand and act on issues of global significance. The global competence matrices help explain Global Competence and how to apply it. They were created as part of the Council of Chief State School Officers’ EdSteps Project, in partnership with the Asia Society Partnership for Global Learning. Checklist for Teaching for Global Competence - Is a great source to help you generate ideas and assess if you are meeting the already created criteria provided by Educating for Global Competence: Preparing Our Youth to Engage the World. Here are two sample questions for you. Each question comes with specific criteria to help you check for global competence. (1) Have I selected a topic of local and global significance for this unit/project/visit/course? (2) Have I planned performances of global competence for this unit/project/visit/course?